A recipe for a layered baking mix in a canning jar can come in really handy when you need a little extra something to give as a gift around the holidays. They go together fast and often use frugal ingredients too. When my husband taught Sunday school for several years, he would receive these every so often as a teacher gift – and I was happy to get them! 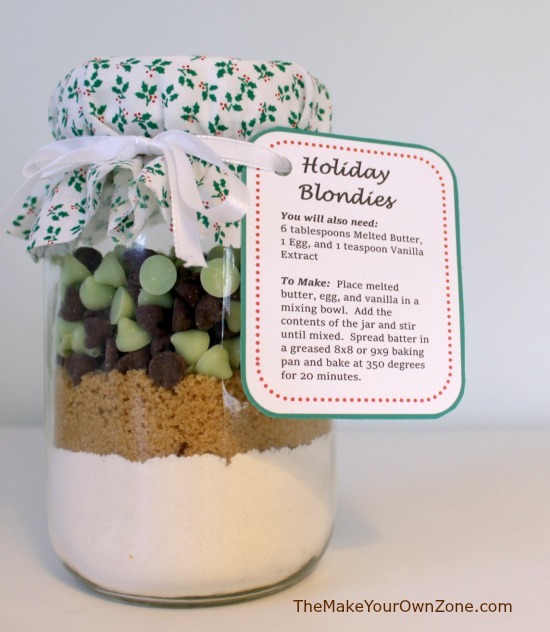 So for the last installment in this holiday series of ideas for jars (here’s Idea #1 and Idea #2), I’m sharing this recipe for a layered baking mix in a quart size canning jar that let’s the recipient of your gift bake up some Holiday Blondie Bars. If you’re not familiar with Blondies, they got their name because they are bars sort of like brownies . . . only not fudgy and brown . . . so you can’t call them brownies. So Blondies it is instead! 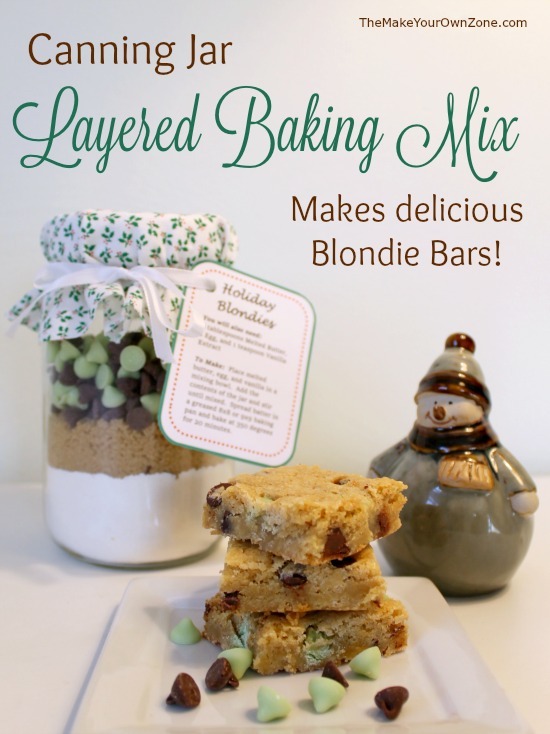 This layered mix only has three layers, but I still think it can look festive depending on what kind of baking chips or M&M’s you use for the top layer. 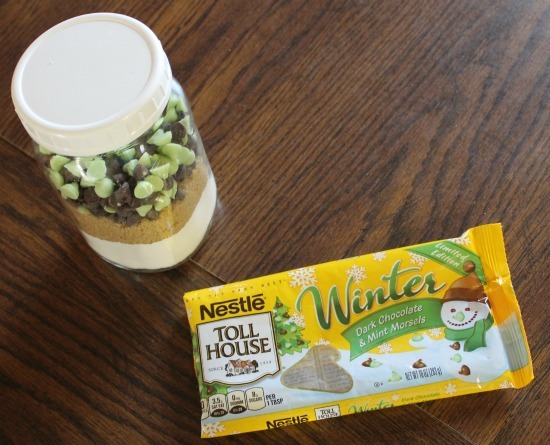 I use the Nestle Winter Mix chocolate chips that includes some green mint flavored chips in the bag and adds to the festive look of the jar. (The mint flavored chips also make for a very tasty, holiday-ish kind of bar). You can also use the red and green M&M’s for a nice Christmas look. Of course you can also just use plain chocolate chips – OR – a 1/2 cup of chips and a 1/2 cup of chopped nuts. I prefer to use the wide-mouth quart canning jars for these layered mixes too because it gives me a little more room when scooping in the ingredients. However regular-mouth jars work too if that’s what you’ve got on hand. I finish up my jars by covering the top with a circle of fabric, I tie a ribbon around it, and include a tag with instructions for using the baking mix. 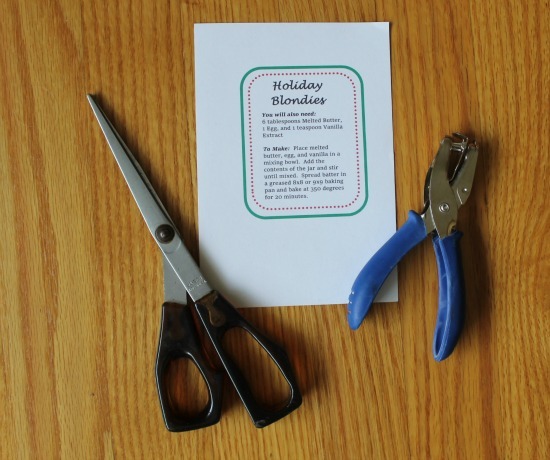 I’ve included free printable tags below for you too! First Layer: Combine the flour, baking powder, and salt in a bowl. Then put the flour mix in the jar. Third Layer: Finally, add the cup of whatever type of chocolate chips, or other baking chips, or M&M’s that you are using. 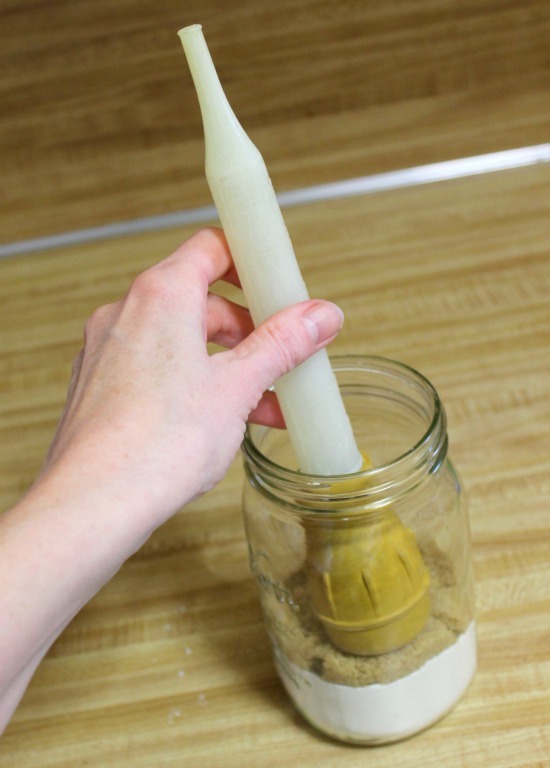 Note: I use the bulb end of my turkey baster to gently pack down the layer and make it more even. It works good! Before adding the next ingredient, you can also wipe the inside of the jar as needed with a piece of dry paper towel to keep things looking clean and neat. To add the final finishing touches to make your layered jar mix ready for gift giving, cut a circle of fabric about 8″ wide and place it over the top of the jar. I usually then secure the fabric around the top with a rubber band. I then tie a ribbon around the top of the jar (covering the rubber band) and add a tag with the additional ingredients needed and baking instructions. 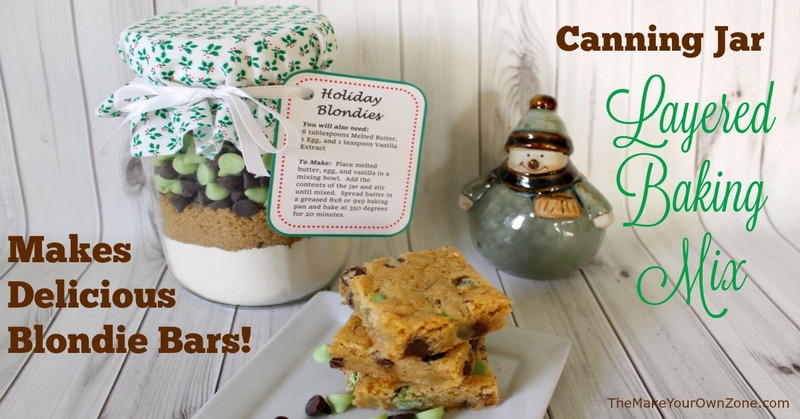 The third link is for a tag that simply says Blondie Bars (with no red and green borders) and can be used any time of the year or for those times you are just using plain chocolate chips. You will also need: 6 tablespoons of melted butter, 1 egg, and 1 teaspoon vanilla extract. To make the bars: Place melted butter, egg, and vanilla in a mixing bowl. Add the contents of the jar and stir until mixed. Spread the batter in a greased 8×8 or 9×9 baking pan and bake at 350 degrees for 20 minutes. As has been my practice for the last few years, I will be taking a little blogging break during the week of Christmas and the week of New Year’s. I wish you all a very merry and blessed Christmas and we’ll see you all again in the New Year with more bright ideas for homemade living!